At IKEA we believe that automation is the key to providing good jobs and quality products at affordable prices. Our largest BILLY bookcase supplier, Swedish Gyllensvaans Möbler, has more than doubled their efficiency in the last 15 years. Today, each co-worker produces on average 33 000 products per year, compared to 13 000 in 2001. “We have always tried to stay at the forefront of technological development. Automation has been a necessity to us. You can’t produce in a high cost country and sell to the rest of the world unless you invest in efficient production set-ups,” says Erik Gyllensvaan, CEO and part owner at Gyllensvaans. The number of employees at Gyllensvaans has remained approximately 200 since 2001. However, the amount of furniture produced by each co-worker has constantly increased due to more and more automated production. The most significant increase in efficiency took place between 2008 and 2010, when Gyllensvaans went from an annual output per worker of 24 000 to 31 000 products. The increase was made possible by investments in a completely new production set-up, with high automation and less manual work. The new production set-up also improved working conditions by removing tasks such as lifting of heavy parts. Many smaller improvements are made on a daily basis. The machine operators make follow-ups on all the daily production errors in order to find bottlenecks and areas in need of improvements. “We are especially trying to find production errors that happen often and are easy to adjust, but sometimes bigger improvements are needed. The last, bigger improvement of this packaging line was made this Christmas,” says Ulrika Waller, machine operator of packaging line 7 at Gyllensvaans. Packaging line 7, built in 2006, is one of the most automated lines at Gyllensvaans. It is operated by three machine operators and packs BILLY bookcases with folded backs at a speed of up to 18 bookcases per minute. Another recent improvement was made after the “Open the Box Initiative” initiated by IKEA. The ambition was to find out why three out of ten customers found scratches on their BILLY bookcases. Together with IKEA, Gyllensvaans opened and analysed packages of finished goods during a full day. “We found a lot of dust in the packages, leading to pressure marks and scratches. In general it’s not a quality issue that makes customers return the product, but they might still be disappointed,” says Erik Gyllensvaan. In order to reduce the dust and improve quality, Gyllensvaans analysed the cause and installed rotating brushes with antistatic agents in the machine lines and compressed air cleaning devices to blow saw dust from the drilled holes. In total, they reduced quality deviations by 50%. 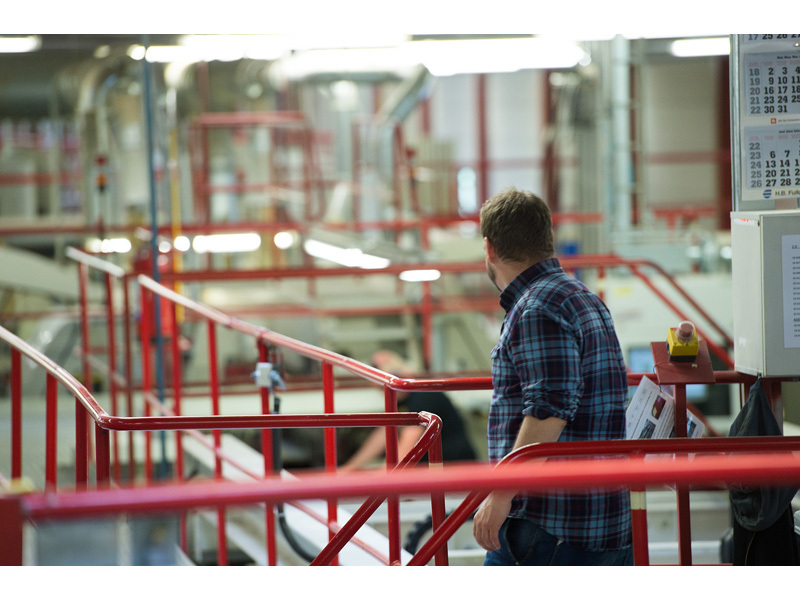 The current production at Gyllensvaans is adapted to product cycles running for many years. Increasingly however, more flexible production lines are required due to shorter product cycles. Currently, Gyllensvaans is running a pilot test on packaging robots with optical monitoring. This new technology opens up for a faster and more adaptable packaging line. “We are constantly working together with our suppliers to increase their competitiveness. The future belongs to those with the most efficient production techniques, and I hope that more suppliers will follow Gyllensvaans example,” says Mikael Sernelin, business development manager at IKEA. Mårten Gyllensvaan looks out over the production line were BILLY bookcases are made. Mikael Sernelin, business development manager at IKEA. Packaging line 7 is one of the most automated parts of Gyllensvaans Möbler. Gyllensvaans Möbler is the worlds largest supplier of BILLY bookcases.